Ports Authority moved as joint league leaders with East End Lions, thanks to a 1-0 win over Bo Rangers on Wednesday at the Approved School ground. 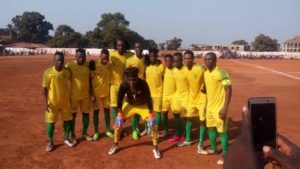 Incomer, Foday Ballack Mansaray, scored the only goal in the 44th minutes, as the Water Front Boys secured their second successive victory and secured six-point from two matches. The defeat was Bo Rangers second, after losing their opening match by the same score line to FC Kallon in Bo. At the Parade ground, Mighty Blackpool registered their first point in the league after forcing host, Central Pararade to a goalless draw. The home side were looking forward to a second win after their 2-0 win over Anti-Drugs in their league opener, but they were frustrated by the Tiss Tass Boys, who were looking forward to grab their first point in the league.